The Space Foundation is an international, nonprofit organization and the foremost advocate for all sectors of the space industry - civil, commercial, and national security. Founded in 1983, the Space Foundation is a leader in space awareness activities, educational programs that bring space into the classroom, and major industry events, all in support of its mission: "to advance space-related endeavors to inspire, enable, and propel humanity." An expert in all aspects of the global space industry, the Space Foundation publishes The Space Report 2009: The Authoritative Guide to Global Space Activity and provides three indices that track daily performance of the space industry: www.SpaceFoundation.org/spaceindex. 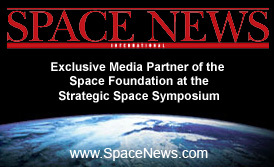 In addition to the Strategic Space Symposium, the Space Foundation will conduct the 26th National Space Symposium in Colorado Springs, Colo., April 12-15, 2010. Headquartered in Colorado Springs, the Space Foundation conducts research and analysis and government affairs activities from its Washington, D.C., office and has field representatives in Houston, Texas, and Cape Canaveral, Fla. Visit www.SpaceFoundation.org for more information.